Finally, this is something I wanted to add for quite a long time: GPS support. I’ve added now GPS functionality to both, Windows Mobile and Diving Log 5.0 on the desktop. 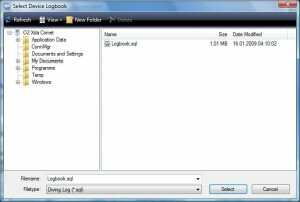 In this blog post I cover the Diving Log GPS Tool for Windows Mobile which is now available. 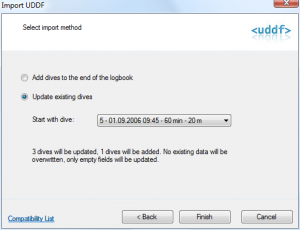 I’ll post soon an update for Diving Log 5.0 which allows you to download coordinates directly from a connected GPS device and adds also support for several coordinate formats in the dive site dialog. The GPS Tool for Windows Mobile is touch optimized (finger friendly) and can be downloaded here (copy to the device and tap on it). It requires .NET Compact Framework 3.5 and runs as a standalone tool in addition to Diving Log 4.5 for Windows Mobile. 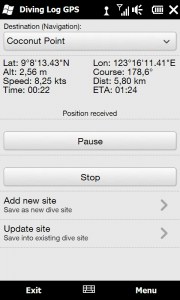 If you have Diving Log 4.5 installed on your phone, the GPS Tool will connect to your logbook on the device and allows you to store coordinates into existing dive sites or as a new dive site. You can later sync these dive sites with coordinates back into your desktop logbook and Diving Log 5.0. The tool has also basic navigation features, which can be handy when you are on a dive boat. You can select any dive site from your logbook and it will display the distance from your current position, the travel speed, course, time and ETA (estimated time of arrival). You can select between several unit types in the menu. During the implementation of the GPS functionality I’ve found also an interesting tutorial how to connect your Windows Mobile phone to your PC and using the phone GPS as an external GPS device for your desktop. This way you can use the upcoming GPS functionality in Diving Log 5.0 without the need for a separate GPS device when you have a Windows Mobile phone with built in GPS. In February Microsoft presented the successor of Windows Mobile 6 to the public, the new Windows Phone 7 Series. Last week they told the developer story at the Mix10 conference, and now I can write something about my plans for Diving Log for Phones. Even if the UI looks great, behind the scenes are still many limitations and two of them are a big deal for a logbook app: currently there is no database accessible, so it’s difficult – but not impossible – to store the logbook data. And the 2nd issue is that there is currently no way to sync the logbook data locally to the phone. Even local WiFi, which we use for the iPhone sync, is not possible for now. The only way to get data onto the phone is from the “cloud”, which is just a geek word for internet. I’m pretty sure that these limitations will be fixed in future updates, but for now we must get used to it. 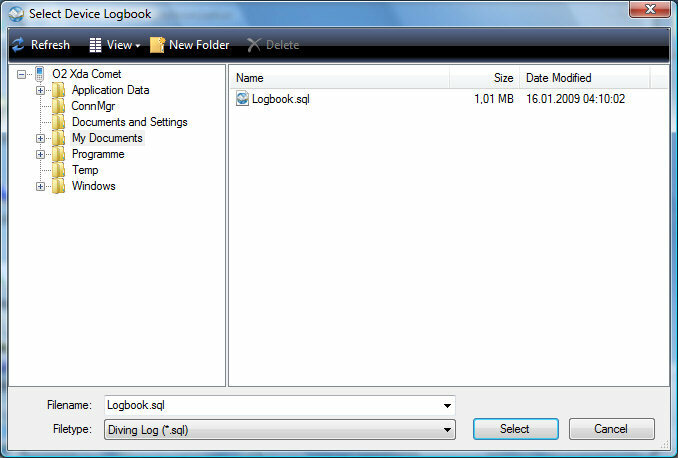 Anyways, I have already some ideas to get around those problems and still integrate with Diving Log on the desktop. It’s too early to tell any details or even release dates, but I try to have something out at the launch. Apps can only be distributed via an App Store, just like on the iPhone. I think this is also an improvement for everyone, given the fact that it was sometimes a real pain to install something on a Windows Mobile phone. And old apps won’t run on Windows Phone 7, so everyone will have to recreate their apps. These are the facts so far. So what about Windows Mobile 6 and older devices? No existing device will be upgradable to Phone 7, including the new HTC HD2. But do not fear, I’ve already started working on an update for the legacy platform (renamed soon by Microsoft to “Windows Phone Classic”). The next version “Diving Log 5.0 Phone” will be optimized for touch with a fresh interface similar to the iPhone Dive Log. Microsoft will continue to support Windows Mobile 6.x for quite some time and existing devices won’t stop working of course with the release of Phone 7 Series. Generally said I will focus this year on the mobile experience, but also continue to improve the desktop version (the final version 5.0 should be available next week). So stay tuned! 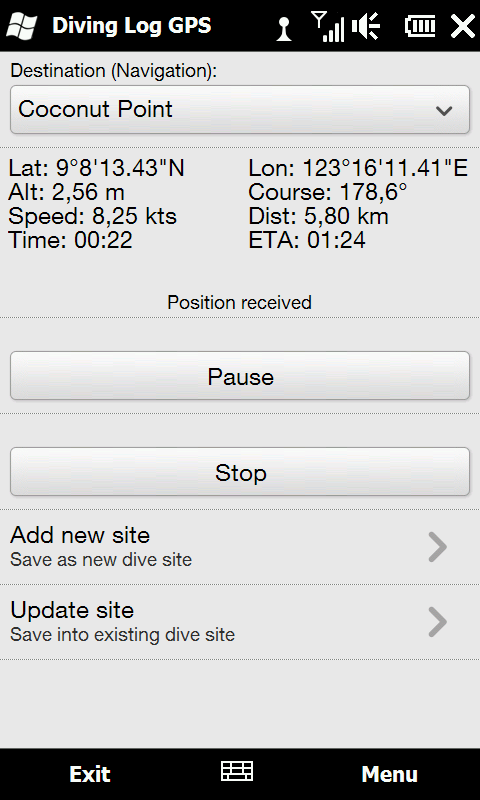 This has been requested for quite a long time now, mainly by iPhone and Window Mobile users: the ability to enter the basic information directly after the dive in the mobile application, sync this data to the desktop and download or import the dive profile and other data from the dive computer to complete the logbook data. Up to now this was some pain, because you had to copy and paste the profile data into the existing dives. 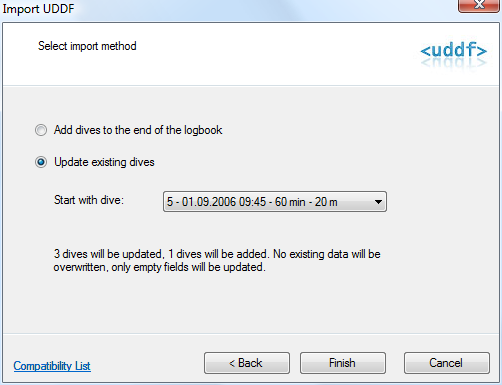 To make this really work well I had to add a way to import dives not only to the end of the logbook, but also to update existing dives. What sounds very easy at first glance was in reality some challenge if I want to do it right. I had to make sure that the import wizard GUI communicates well what will happen during the import to avoid confusion. I had to make sure that I don’t overwrite existing data (data which was already entered in the mobile application). And last but not least I had to find an elegant way to implement this with reasonable effort for the many importers and downloaders which are included in Diving Log. Curiously it took more than half a year to find the right way and the best solution for this task, but programming and testing this feature took only 2 days. But sometimes it is worth to wait a little bit longer for the right idea. This feature is now available for the existing .NET based importers, which are: BFT Tiger, HS Explorer, Liquivision X1, DAN DL7, Shearwater, APD Inspiration, UDCF, UDDF, NiTek Logic and MacDive. Next week I’ll release an update for the downloaders Uwatec Smart, Aladin, Memomouse (new beta), Suunto, OSTC and Sensus Ultra which includes also this feature. I try to convert the most important other importers (Mares IRIS/DRAK, Oceanlog, Suunto DM,…) as soon as possible also to .NET so that most Diving Log users can make use of it. I know this one took a while, thank you for your patience! 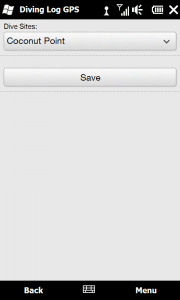 Diving Log 4.0.13 and Diving Log 4.5 for Windows Mobile has been released. This is only a minor update and contains mainly the patches and updates released during the past 4 month and the new sync function for Windows Mobile. So if you have already installed all updates or the changes (see change log) are not useful for you, you don’t necessarily have to update to this version. It targets mainly new users or if you want to install Diving Log on a new computer, thus you don’t have to apply all updates. I’ve removed the old minor update downloads to avoid overwriting newer files with old ones. If you want to use the new Windows Mobile sync function, please make sure you read the release notes. This update fixes some bugs and the entry time field has been added to the dive details. 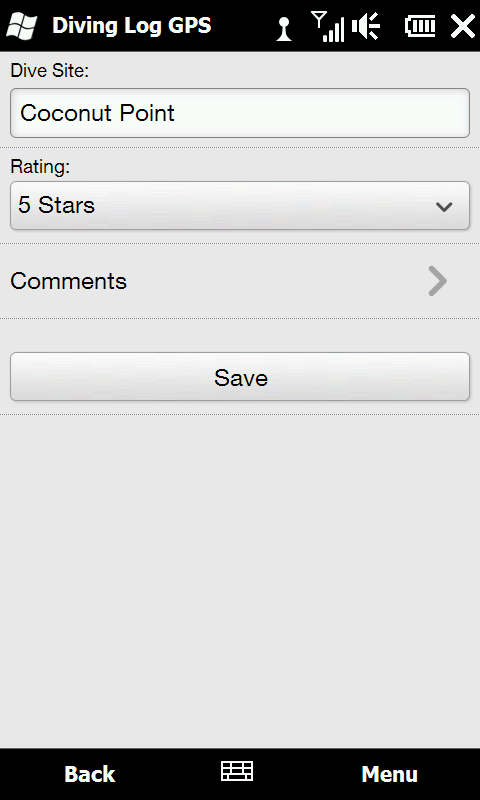 You can install this setup directly, it will update your existing 4.5.0 version to 4.5.1. Due to the feedback I’ve got from the last beta, in this version a bug in the “Save dive” and “Save as new dive” routine is fixed. And this version uses a newer SQLite runtime because the old one caused in some cases errors on some WM 6.1 devices. 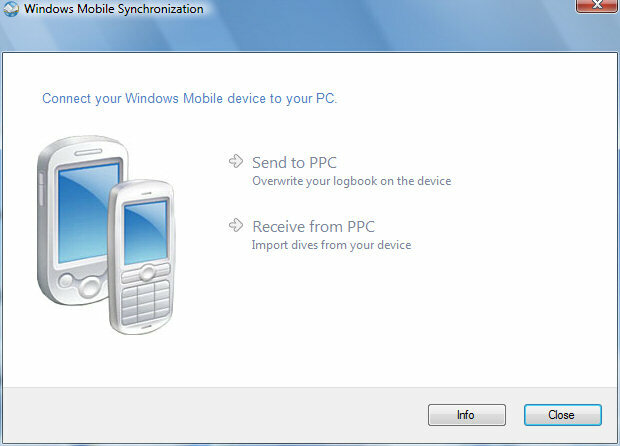 Everyone who is still using PPC version 4.0, please make sure you read also this posting to get the new sync function. 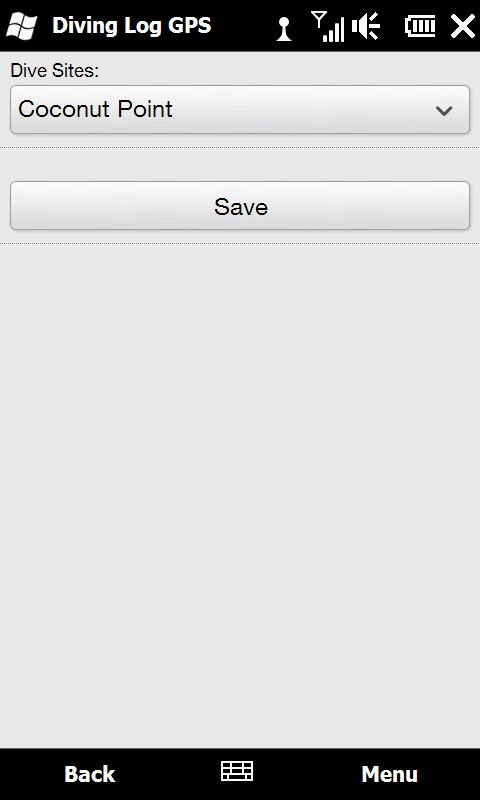 The new sync function has been improved a lot and is more reliable than the existing one. 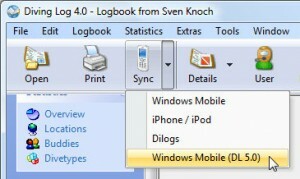 The new logbook format on Windows Mobile is a SQLite database which can be created on the desktop and then transferred to the device during the synchronization. It is exactly the same database as used in the iPhone Dive Log which makes code maintaining a lot easier. 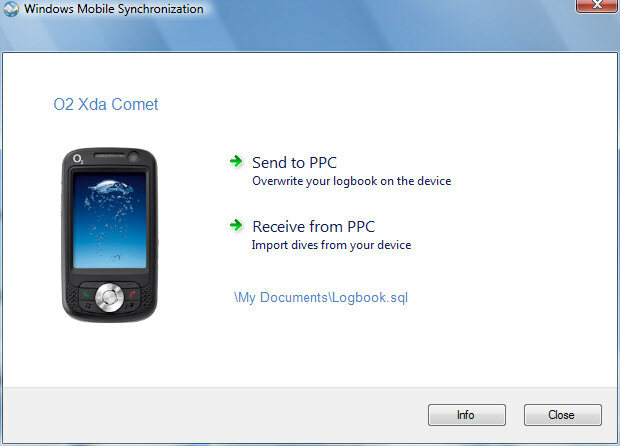 Diving Log 4.5 for Windows Mobile has not yet any new features, only the logbook format has been changed to support the new sync function. 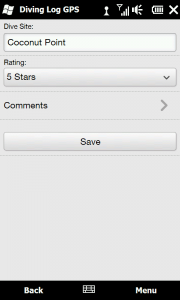 It has been tested on Windows Mobile 6 and 5 but should also run on the 2003 version. Please provide feedback about the sync function and Diving Log 4.5 for Windows Mobile, either in the comments or via Email.